While TD Bank has some decent benefits that other lenders don’t offer, as well as competitive rates for home equity loans, the restrictions that require you to visit a branch to close on the loan push TD Bank just out of the best lenders we’ve reviewed. Excellent overdraft protection for home equity lines of credit. In-person signing required, even if you applied online. TD Bank is a bank and lender that operates in 15 states as well as Washington D.C. They have a number of unique policies and benefits, and scores well on consumer surveys. As a result, TD Bank is an excellent place to look for a home equity loan or home equity line of credit. Comparing home equity lenders by their rates and fees can be challenging. This is because every lender offers different products. Moreover, lenders operate in different states, and thus are subject to different laws and regulations. As a result, an apples-to-apples comparison of fee and rate structures can be difficult. In general, the rates TD Bank charges were slightly less than other lenders. However, TD Bank is more likely to charge various administrative fees than other lenders. Specifically, TD Bank is more prone to charging application fees, closing costs, and early payoff fees. Evaluating eligibility requirements is another difficult task when comparing different home equity lenders. The most effective means of doing so is to establish a matrix of different values to get a complete understanding of the scope of the different products they offer. Some of the best metrics include debt-to-income ratio, maximum loan-to-value, minimum credit score, and equity requirements. One of the more unique advantages of using TD Bank as a home equity lender is that they allow you to take out a home equity loan or home equity line of credit on a second home or rental property. Many other lenders don’t offer this service, making TD Bank one of the only providers if you are looking to use a second home or rental property for your home equity financial product. Another important factor to consider is residency. TD Bank operates in 15 states and Washington D.C., so if you do not live in one of those locales you will not be able to get a loan or line of credit through TD Bank. TD Bank has some of the best loan requirements out of the companies we’ve reviewed in terms of minimum and maximum loan amounts. The result is that customers can get the loan that best suits their needs, without having to take out more or less than they require. Something important to note, however, is that on higher loan amounts there may be extra fees. In terms of their HELOC products, TD bank offers standard timeframes and rates. One unique advantage that TD Bank HELOCs have is that you can get an overdraft protection EquityPlus account. No other lender we reviewed offers this particular product. 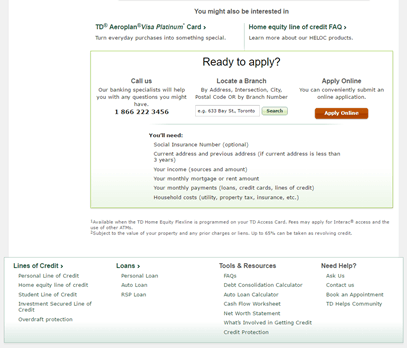 TD Bank hosts a variety of state specific home pages, so customers can be sure of the basic terms of the products offered in their state. However, one potential downside of TD Bank is that you must do the closing in person at a branch. Therefore you should make sure there is a branch near you or you will find yourself spending a long drive to close your loan. 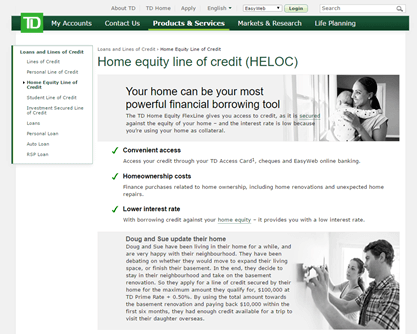 The home equity loans and lines of credit offered by TD Bank offer a number of unique features. While there were some issues with the online services, customer service on the whole was good, making TD Bank a good place to look for a home equity loan or line of credit.